Steve Carr - A slide presentation on the Birds of the Bible. There are 30+ bird species mentioned in the Bible. Meet at 7:00 PM in the Bean Museum Auditorium on the BYU Campus. June 4th (Sat): 5:00 am - Pelican Lake and Ouray NWR - Target birds: American bittern, black terns, waterfowl, waders, and any straggling peeps and warblers. Meet at 5:00 A.M. at the North end of the Springville Wal-Mart parking lot - Exit 263. 1. We plan to arrive at Ouray at around 7:30 a.m. We'll begin by walking some of the dikes in the Leota bottoms unit. We'll then make the auto tour loop around Sheppard Bottom. We should arrive at Pelican Lake sometime around mid to late morning. 2. There are no services in the area. Plan on starting the day with a full tank of gas and on bringing your own food and water. 3. I would advice long pants and a long sleeved shirt as protection against the insects we will encounter. Not all of them are deterred by mosquito repellant, which should none the less also be an essential part of your trip supplies. 4. We will leave promptly. Please don't be late! June 18th (Sat): 7:00 am to about noon - River Lane and Lincoln Point - Meet at 7:00 A.M. at the Sam's Club parking lot in East Bay in Provo(1313 S University Ave). We meet at the end of the parking lot next to University Ave. Despite the advent of the internet and television, newspapers are still popular. A national survey determined that a sizable number of the USA population read a newspaper for useful information, entertainment, and relaxation. Many people include newspaper reading as an important part of their day. I start most mornings (unless going out on an early birding trip) by reading two newspapers. A newspaper is convenient. It is easy to hold. It allows readers to read in-depth reports that go beyond the brief news on websites or television. History: The second-largest woodpecker in the world at an average of 20 inches long, it lived in swampy forests throughout the southeast United States, ranging into eastern Texas. It was thought to be one of six extinct bird species in North America. Characteristics: It has a distinctive double rap on wood. In flight, it is swift and loud. Recent discovery: It has been sighted in an area about 120 miles long and up to 20 miles wide in the Big Woods of eastern Arkansas. The area known as the Corridor of Hope, which includes the Cache River National Wildlife Refuge, is home to seven endangered species and 265 species of birds. What it means: The federal government has proposed committing more than $10 million to protect the bird's habitat. That is in addition to $10 million raised by private groups. New York, NY - A construction company removed the 11 year-old nest of red-tailed hawks from a Fifth Avenue apartment building, upsetting both residents, bird lovers, and city officials. The hawks were the center of a flap between bird lovers and residents of the posh building. After days of negotiations and vigils, the hawks were allowed to rebuild their nest. Wichita, KS – Roadrunners are being seen more often in Kansas and farther north due to milder winters encouraging the birds to expand their range. Roadrunners have not been spotted in southern Kansas since the 1920s. Lincoln, NE – Blinds have been set up at the Platte River Valley bird Observatory at Crane Meadows for the public to view prairie chickens’ odd and energetic mating ritual. Walker, MN – Federal sharpshooters are killing cormorants on Leech Lake to cull the growing flock of birds, blamed for declining walleye numbers. The cormorant population soared from about 150 nesting adults in 1998 to more than 5,000 last year. The birds each gobble up about a pound of fish daily. Officials estimate they ate more than 1 million pounds of fish last year. Washington, DC – A mallard and 10 of her ducklings hatched in front of the Treasury building. Government biologists captured and transported them to a better location. Mack, CO – A reward in the illegal shooting of five sandhill cranes reached $5,100 after an anonymous donor doubled his $2,500 contribution. Fines for a conviction would range from $80 to $1,000. The birds are not endangered, but there is no open hunting season for them. Cranford, NJ – Wild turkeys, which can fly as fast as 55 mph and grow to 4 feet tall, have been attacking local people. In one instance, a group of turkeys surrounded a letter carrier’s truck and wouldn’t let him out, and he killed one bird with a stick. Wildlife officials can’t explain the aggression. The Great Salt Lake Bird Festival received a full page article with six photographs. While the festival is sponsored by Davis County, many Utah County birders attend and several make presentations during the festival. One of the popular events known as Utah County Hotspots was conducted by Dennis Shirley. A large group of birders started at 7:00 AM in Springville and finished at 3:00 PM. The trip totaled 95 species. Among the top birds seen were the Common Grackle and MacGillivray’s Warbler. The Deseret News’ Outdoor section devoted 1½ pages (story and photos) to the Great Backyard Bird Count. This same newspaper had another article on the Raptor Inventory Nest Survey in which more than 100 volunteers locate and record the nests of eagles, owls, and hawks in northern Utah. Merrill Webb’s color photo and story appeared in the Provo Herald. The article said “now that he’s retired, he’s getting paid for the hobby he has pursued all his life. Merrill Webb, an avid birder, now conducts bird surveys for the U.S. Forest Service.” The story provided Merrill’s other birding activities. Robin Tuck’s color photo and story appeared in the same Provo Herald issue as Merrill’s. It tells of the bird which triggered him to become a birder (a bald eagle in Alaska). On the same page, the story of Robin and his wife, Julia, was given including their romance, and Julia’s battle with cancer. Brigham City -- Brigham City public works crews repaired the 12-foot gouge in the road leading to the Bear River Migratory Bird Refuge. Manager, Al Trout, who has been fielding calls and visits of travelers from throughout the West frustrated about lack of access to the bird sanctuary. The road was closed April 30 after a farmer used a backhoe to cut a hole in the road. St. George -- When Greg Clark inserted a video camera into the den of burrowing owls, he knew the relocation of nine of the small birds just over the Utah state line in Arizona was a success. "There are some eggs," Clark told a handful of volunteers watching the portable video monitor as the infrared camera snaked into the darkened hole. "That's pretty much what we were looking for." Clark heads relocation efforts for Wild at Heart, a nonprofit group. Davis County -- Eagle enthusiasts can't see the birds for the trees -- the lack of them -- at Farmington Bay. Most of the gnarly trees that once lined the bay a few miles west of Farmington are going or already gone. And the hundreds of bald eagles that roost in the trees each winter before migrating north for the summer might go with them. Salt Lake City -- There is some debate regarding turkeys in the Beehive State. Division of Wildlife Resources biologists believe the Merriam's subspecies is native to southern Utah. Others think evidence of turkeys at Indian ruins indicates the birds were domesticated by native peoples and possibly brought to Utah as a traded commodity from the east. Either way, there was no evidence of wild turkeys when pioneers arrived. The next time you read a newspaper, scan it for articles about birds and you may be pleasantly surprised to see something about the creatures we spend hours watching and about the hobby we share. At 5:15 A.M. Wednesday May 4th Reed Stone led two car loads of Utah County Birders to the Sheep Creek area to look for strutting Blue Grouse. On our way up, with just enough dawn light to see the surrounding hills, we spooked a Great Horned Owl off a fence post next to the road. As the owl flew to the top of an aspen tree the two cars made a quick U-turn. We watched the owl for a couple minutes then it dove into the sage brush after some prey. It was still too dark to see if its strike was successful when it flew across the road and down the hillside. The air was cold and crisp and the Sheep Creek area was LOADED with herds of Mule Deer and Elk. Green-tailed Towhees, Brewer’s and Vesper Sparrows sang from all sides at every stop. At one stop we had Mountain Bluebirds singing and flying around us. One male gave us a particularly good view when he lit at the tip of a nearby oak tree and sang as the sun came up. We even got our target bird, a male Blue Grouse strutting between sage brush well up on a hillside. Then we glimpsed a couple hens slinking off the roadside as we drove by them a little farther up the road. I counted 17 species and we were back around 9:00 A.M. Thank you Reed for leading a quality trip. We had a good turnout for our morning bird walk at Skipper Bay on Saturday. A walk to the end of the trail and back was very rewarding. We ended with a group list of 62 species! I counted 60 myself. I thought this a good number for just a few hours in a limited area. Some of the more interesting sightings included a Ross’s/Snow Goose flying in a V of Canada Geese, a large mixed flock of White-faced Ibis, Snowy and Cattle Egrets in the cow pasture, an Osprey on its nest, 5 Sandhill Cranes in the field, and a winnowing Wilson’s Snipe. We saw many passerines in the trees along the trail including 7 species of warbler (Orange-crowned, Virginia’s, Yellow, Yellow-rumped, MacGillivray’s and Wilson’s Warbler and Common Yellowthroat) and 6 species of sparrow (Green-tailed Tohee, Chipping, Brewer’s, Savanna, Song and White-crowned Sparrow). 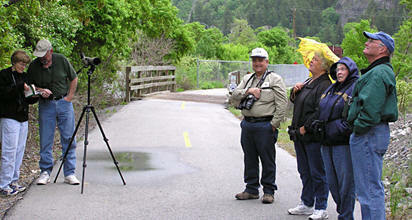 Eight Utah County birders met early Saturday morning, May 21 to practice and review our listening skills. We started at the Ox-bow on the Provo River and heard/saw such birds as Song Sparrow, Canada Goose, Yellow Warbler, Great Blue Heron, Brown-headed Cowbirds, Warbling Vireo, Ring-necked Pheasant, and California Quail. Then we drove up to the Pavilion at Rock Canyon and listened some more. There were Scrub Jays, Spotted Towhees, Lazuli Buntings, Orange-crowned Warbler among others. Most of us have trouble with the Lazuli Bunting sound--is it because we hear it only for a few weeks each year? Thanks to those with "good ears" for helping the rest of us! 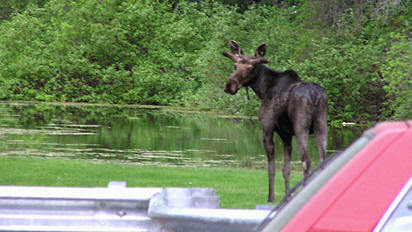 Our Vivian Park bird walk started out with a bang when a young Moose greeted us as we gathered in the parking lot. He came down South Fork then walked upriver. Other sightings right from the parking lot included an Osprey fishing in the pond, a Cassin’s Finch, a swarm of Violet-green swallows flying around and a Gray Catbird singing down by the river. We then headed up South Fork hoping to see more before the storm hit, but only gained a few minutes of birdless birding before being rained out. In all, we birded a little more than an hour and counted 18 species. 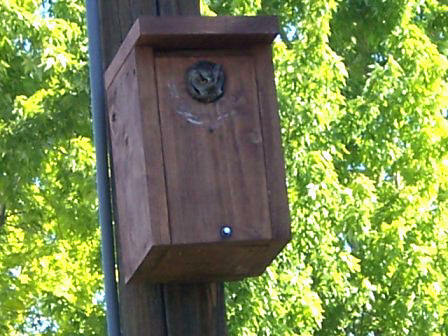 The Western Screech Owl in my new owl box has been a wonderful addition to my yard. Starlings used to go in and out of it and I worried that they would nest there. Then one afternoon, to my great surprise I saw an owl peering out of the box. The birds at my feeders had seen him too and had all gone to higher wires and were making a lot of racket. One lone robin stood slightly below and to the side of the box and looked right at the owl and scolded and scolded. The owl seemed unconcerned. Another day I saw the owl looking at the birds at the feeders below. They had not detected him yet. He looked all around, up and down, and just sat quietly watching everything. I thought he was starring straight at me. (I watch from my bedroom window) He usually leaves the nest about 9 p.m. and flies into a pine tree nearby. Sometimes I have seen him at night sitting on a wire above my hot tub. Once I saw him fly back to the nest with dinner for the family within. He just stayed a couple of minutes and then left again. I have spent a lot of time looking for and at this interesting owl. I hope to catch sight of young ones soon. It is exciting to have such a neat bird in my yard. If you have a random observation you would like to share please send it to newsletter@utahbirds.org. California Quail - 25 of them clogging up the feeders. California Quail - you gotta love their topknot plume! Western Tanager - Several visits by more than one. Aren't they beautiful? Black-throated Gray Warbler - Runner-up was a House Wren. MacGillavray's Warbler - in my bird bath 3 days in a row. California Quail - A pair, I hope they nest. Lazuli Bunting & Bullock's Oriole -- first time ever seen in my backyard . Rose-breasted Grosbeak - first for yard. We would like you to share your favorite backyard bird each month. Please send your favorite bird at the end of the month to newsletter@utahbirds.org or call 360-8777. If you would like a reminder at the end of the month e-mail the above address.